THE DÁIL WILL tonight debate a motion which calls on the government to ‘burn the bondholders’ by ‘destroying’ the €25 billion in sovereign bonds that were issued as a replacement for the promissory note earlier this year. A motion, signed by many of the Technical Group and three independent TDs, calls on the coalition to lobby the European Central Bank (ECB) to allow the State to “destroy” the bonds issued as part of the deal to abolish the promissory note earlier year. In February, the government dramatically liquidated the former Anglo Irish Bank, and scrapped the promissory note arrangement – which required it to pay back €3.06 billion every March for the next decade as result of guarantees made in respect Anglo – replacing it with long-term bond structure. As part of this, the Central Bank of Ireland (CBI) issued €25 billion in sovereign bonds. The Technical Group now wants the government to lobby the ECB to allow the CBI to ‘destroy’ those €25 million bonds, as well as the €3.06 billion that was paid as part of the old promissory note arrangement back in March 2012. 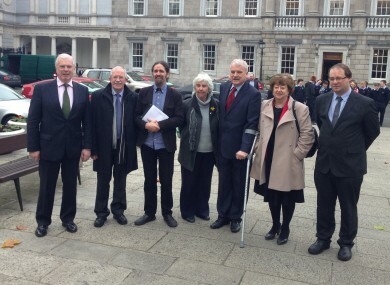 The motion comes on foot of work that some independent TDs have been doing with the Ballyhea Says No organisation, a group which has been marching once-a-week for the past two years against what it says is the ‘European Central Bank-enforced extortion of tens of billions from the Irish people’. The motion, being debated tonight for 90 minutes, also calls for any and all interest payments currently being made on these bonds to be stopped. Another deputy supporting the bill, Catherine Murphy, estimated that she and her colleagues have received around 100,000 emails supporting this cause in the last week. The motion has the support of Technical Group members Joan Collins, Flanagan, Murphy, Mick Wallace, Shane Ross, Tom Fleming, Joe Higgins, Clare Daly, John Halligan, Seamus Healy, Richard Boyd Barrett, Stephen Donnelly, Finian McGrath, Maureen O’Sullivan, Mattie McGrath, and Thomas Pringle. In addition the motion is also signed by the former Labour TDs Patrick Nulty and Tommy Broughan and the former Fine Gael TD and banking expert Peter Mathews who said Ireland has been saddled with “odious debt”. Sinn Féin has declared its intention to support the motion. However, the government will almost certainly oppose the motion and ensure that it does not pass when a vote is held tomorrow night. Separately, the High Court has today ruled against the United Left TD Joan Collins who challenged the constitutionality of the promissory note arrangement. Collins argued that the arrangement was not in line with the Constitution as it was not explicitly approved by the Dáil. However a three judge panel of the High Court has ruled against her, RTÉ reports. Email “‘It’s odious debt’: Dáil to debate ‘burning the bondholders’ tonight and tomorrow”. Feedback on “‘It’s odious debt’: Dáil to debate ‘burning the bondholders’ tonight and tomorrow”.